Poland recently enacted a libel law aimed at punishing those who publicly accuse the country of complicity in the Holocaust or other crimes against humanity. The new law has raised concerns that the country’s history of anti-Semitism and xenophobia in Poland could be obscured. Polish views are more negative when it comes to two other minority groups in Europe: Muslims and Roma (sometimes called Romani or Gypsies, a term some consider pejorative). Roughly four-in-ten or more Polish adults say they would not want Muslims to be citizens of their country (41%), their neighbors (43%) or members of their family (55%). Likewise, at least three-in-ten Poles would not accept Roma as fellow citizens (30%), neighbors (38%) or family members (49%). Polish attitudes toward Jews are typical of the public’s views in many of the 17 other countries Pew Research Center surveyed in Central and Eastern Europe. For example, nearly as many Russians as Poles (14% vs. 18%) say they are unwilling to accept Jews as citizens of their country, while a higher share of Russians than Poles (40% vs. 30%) say they are unwilling to accept Jews as family members. There are no major differences when looking at attitudes toward Jews through the lens of the region’s predominant religious groups – Orthodox Christians and Roman Catholics. While there is considerable variation across countries, the attitudes of the region’s Orthodox Christians are, for the most part, similar to those of Catholics. For example, similar shares of Orthodox Christians and Catholics across the region (medians of 17% and 16%, respectively) say they would not want Jews as neighbors. The same holds true for opinions about Jews as citizens and family members. Attitudes toward Jews are closely related to questions about cultural diversity and national identity. Nearly six-in-ten Poles (57%) say it is better if a society is composed of people with the same ethnic, religious and cultural background than if the society contains people of differing nationalities, religions and cultures. Roughly two-thirds of Polish adults (64%) also link their religion to national identity, saying it is important to be Catholic to be “truly Polish.” And 55% of Poles agree with the statement, “Our people are not perfect, but our culture is superior to others.” In general, in Poland and many countries throughout the region, people who take these kinds of nationalistic positions are more likely to express negative views of Jews and other minorities. Poland’s association with the Holocaust stems in part from the fact that some of the most notorious Nazi extermination camps, including Auschwitz-Birkenau and Treblinka, were located on its territory. It is estimated that during World War II the Germans murdered 3 million or more Jewish citizens of Poland. The new libel law, which contains exemptions for academic and artistic expression, allows prosecutors to seek fines or prison sentences for anyone who publicly accuses Poland of helping to perpetrate the Holocaust or other crimes against humanity. 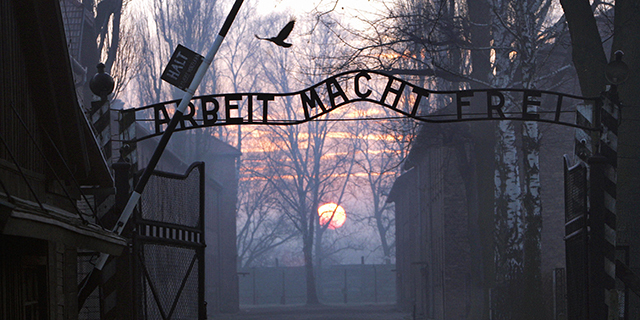 The Polish government says the new law is intended to stop the use of misleading language, such as “Polish death camps,” noting that the whole nation suffered during the Nazi occupation and that an estimated 3 million Polish gentiles also perished during the war. But the governments of the United States, Israel and other countries say that the new statute will stifle free expression. Correction: This post was updated on April 3, 2018, to clarify that the Polish libel law makes it a crime to accuse the country of Poland of complicity in the Holocaust.